There are plenty of entry-premium luxury cars out there claiming to have the brawn to go ten rounds with their sporty competition, but how many of them actually have the mettle (and metal) to back it up? Not as many as you would think. The idea of trying to combine a luxury car with a lithe fighting stance you’d expect out of a sports car is problematic on just about every level. Something just has to give. Do you go for the stiff, planted ride of the sports car at the cost of comfort, or go the opposite way and suffer in the corners? Do you hear every last dripping horsepower under the hood or mute them in exchange for a quiet cabin? That’s the task Mercedes-Benz’s engineers tackled with the C63 AMG. With an impressive 6.3-liter V-8 out front and a suspension to bear the grunt, this car puts its predecessor to shame. Is this luxury with a razor’s edge? Oh yes. Yes it is. The mark of a true sports car is balance, and the C63 AMG serves it up in heaping servings. While you might expect the 451 horsepower to be too much to handle, the optional limited-slip differential – part of the AMG Performance Package at $3,990 – makes power delivery smooth and accessible. Powerful brakes and a refined suspension all make for an exhilarating driving experience without putting you on edge. Oh, and then there’s the sound it makes. You’ll like it. A lot. This car’s styling isn’t for everyone. The C63 builds on the ‘love it, or leave it’ foundation of the current C Class, complicating things – for those who are complicated by power and muscle – with an aggressive front fascia and tuner-esque five-spoke wheels. While we like, some may not. One main problem, at 3,800 lbs, this car isn’t a lightweight. While Mercedes-Benz has done a great job setting up this car’s suspension, the feeling of heft around the corners is somewhat noticeable. From the get go, the C63 AMG conveys a singular purpose – to make and maintain speed. The high-bolstered leather seats hold you snug like a bespoke suit and your palms find the flat-bottomed steering wheel almost intuitively. The engine comes to life with a rumble befitting a 6.3-liter V-8, and while we may be laying waste to the environment with every blip of the throttle, we could care less. With the throttle to the floor and the engine blaring a soundtrack befitting a World War II Spitfire, flipping through the gears via the column-mounted shift paddles comes almost as quick as 100 mph does. This car darts to 60 in under 4.5 seconds – faster than the current BMW M3. Of course, what fun is shooting in a straight line if you can’t carry the speed through the corner? To that end, Mercedes-Benz has produced a suspension head and shoulders above every other model in their stable. While getting used to darting a nearly two-ton car off of apexes takes some time, within a few laps we’re dispatching them with quick glee. While it’s difficult to pick a bright spot on this car, the 6.3-liter V-8 under the sculpted hood makes a good case for itself. The engine produces 451 horsepower and 443 lb-ft of torque. That’s a full 89 more horsepower than the outgoing C55 AMG and 37 more ponies than the vicious M3. The C63 AMG is equipped with a 7-speed Speedshift automatic transmission that puts power to the rear wheels. Mercedes-Benz offers a number of packages for the C63 AMG, including a seating package with memory seats for both the driver and passenger. While the option is particularly helpful for a household that intends to share the car, it will set you back around $2,980. For the more performance minded, an AMG Performance Package, complete with a limited-slip differential, special braking system and track-calibrated suspension is also available. We highly recommend this particular batch of goodies. The Performance package will raise the car’s top speed from 155 mph to 174, but will also hit the bottom line at an extra $3,990. This Mercedes-Benz is available with a Multimedia Package for $2,980 that includes everything from voice control for your hands free calling and audio to a Harman/Kardon 5.1 digital surround sound stereo. Other bits include a 6 gig hard drive and a 7-inch color display for the C63’s navigation system. Though the C63 AMG isn’t going to be winning any fuel economy awards any time soon, it’s numbers are more than respectable given the amount of power on tap. This serious sedan serves up 12 mpg city, 19 mpg highway. Not great, but gas is cheaper now, right? This car is a pleasure to occupy, no matter where you’re sitting. Both the driver and front passenger are treated to comfortable sport leather bucket seats with high bolsters to keep you planted. While ingress and egress aren’t the easiest in the world, ride comfort is amazing. The back seat isn’t exactly cavernous, but it’s big enough to comfortably transport two extra passengers. The C63 AMG’s looks aren’t for everyone. The front fascia serves up plenty of abrupt, sharp angles that seem to reach for a purposeful, aggressive look, but manage to come off a little too tuner. In a car that costs close to $60,000, that’s just unorthodox. This car swims in the same waters as other performance sedans, hitting the check book at $57,175, base, though options like the Multimedia Package and the AMG Performance Package will easily but the car over $60,000. That puts it in the same tank as the BMW M3 Sedan at $54,000, the Lexus IS-F at $56,610 and the 2009 Cadillac CTS-V at $59,995. 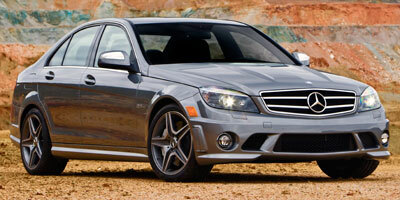 Mercedes-Benz has made an incredible leap with their C63 AMG, especially when compared to the out-going C55 AMG model. With heaps of power on tap and a suspension that communicates exactly what the car’s doing, there’s little to complain about on this car mechanically adept. Inside, fantastic materials and typical Mercedes-Benz luxury are everywhere, blending the polar opposite realms of luxury and performance. It’s not perfect, as is exemplified by some of the styling cues, but it has the power to go toe to toe with the legendary M3, and that’s good enough for us.